Wenatchee, WA – ZZ TOP a/k/a “That Little Ol’ Band From Texas,” lay undisputed claim to being the longest running major rock band with original personnel intact and, in 2004, the Texas trio was inducted into the Rock and Roll Hall of Fame. 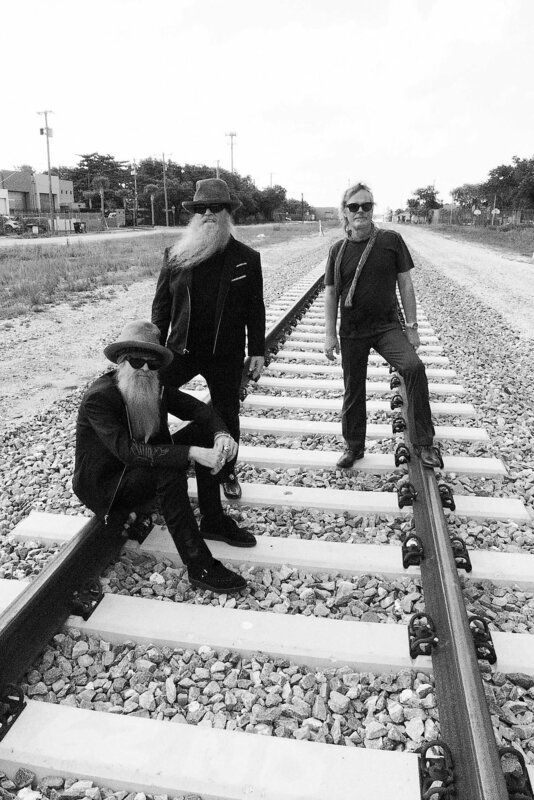 Of course, there are only three of them – Billy F Gibbons, Dusty Hill, Frank Beard -- but it’s still a remarkable achievement that they’re still very much together after almost 50 years of rock, blues, and boogie on the road and in the studio. The rock show is locally presented by STARR Ranch. ZZ TOP’s music is always instantly recognizable, eminently powerful, profoundly soulful and 100% Texas American in derivation. The band’s support for the blues is unwavering both as interpreters of the music and preservers of its legacy. It was ZZ TOP that celebrated “founding father” Muddy Waters by turning a piece of scrap timber than had fallen from his sharecropper’s shack into a beautiful guitar, dubbed the “Muddywood.” ZZ TOP’s support and link to the blues remains as rock solid as the music they continue to play. They have sold millions of records over the course of their career, have been officially designated as Heroes of The State of Texas, have been referenced in countless cartoons and sitcoms and are true rock icons but, against all odds, they’re really just doing what they’ve always done. They’re real and they’re surreal and they’re ZZ TOP. Wenatchee, WA –The Wenatchee Wild, winners of the British Columbia Hockey League’s (BCHL) Fred Page Cup, will continue their championship play to claim the Doyle Cup against the Alberta Junior Hockey League (AJHL) Spruce Grove Saints in a best of seven series this Friday, April 27, Saturday, April 28 and potentially Sunday, April 29th at the Town Toyota Center. From there, the winner gets a berth in the Royal Bank Cup tournament, held this year at Prospera Center in Chilliwack, BC. In conjunction with the Washington State Apple Blossom Festival, the Funtastic Carnival will be in the arena’s parking lot from Friday, April 27 to Sunday, May 6th. This weekend, the Wenatchee Wild fans are encouraged to ride the shuttle bus on Friday and Saturday nights (and potentially Sunday) from the front end of the Shopko parking lot, on the corner of Miller and Maple, to the arena. The shuttle will run from 5:30 p.m. to 10:30 p.m.
For questions, contact the Town Toyota Center at 509.667.7847. For Wenatchee Wild tickets, call 509.888.7825. For Funtastic Carnival information, visit www.appleblossom.org. For all events, parking and ticket information, visit www.towntoyotacenter.com. WENATCHEE WILD CLAIM BCHL FRED PAGE CUP CHAMPIONSHIP! The Wenatchee Wild left no doubt in anyone’s mind that they were the dominant team as they powered their way to a 3-0 win over the Prince George Spruce Kings in Game 5 of the BCHL Finals, laying claim to the league’s championship trophy, the Fred Page Cup. 3,845 fans filled the Town Toyota Center, an impressive number considering the game only became a certainty late Tuesday night when the Wild dropped Game 4 on the road. Wenatchee’s speed forced the Spruce Kings to take a few penalties, including a pair of first period tripping calls. The Wild scored on the first power play as Zak Galambos snapped home a hard shot from the left circle just 2:50 into the game. It was another tripping call, this time in the third period that set up the second goal of the night for Galambos. Team captain AJ Vanderbeck buried an empty netter to secure the win at 17:45 of the final frame, as fans chanted, “We Want the Cup”. Prince George was held to just 8 shots on goal, all of which were denied by Austin Park for the shutout win, but there were quality chances including a couple of shots that rang off posts that just wouldn’t fall for the Spruce Kings as the Wild fired 37 shots at Evan DeBrouwer. Both goalies played exceptionally well. In the end, Wenatchee overpowered Prince George, laying claim to the Fred Page Cup, the first time since 1979 that the Cup has resided on US soil when the Bellingham (WA) Blazers won it. Up next is the regional Doyle Cup, in which Wenatchee will face the Alberta Junior Hockey League (AJHL) Championship winner in a best-of-seven series, either the Spruce Grove Saints or Okotoks Oilers. From there, the winner gets a berth in the Royal Bank Cup tournament, held this year at Prospera Center in Chilliwack, BC. Details will follow, including information on ticket sales for the Doyle Cup. The Wenatchee Wild are celebrating their tenth season in the Valley. Stay up to date with the team all year long on Facebook (facebook.com/wenatcheewildhockey), Twitter (@WenatcheeWild1), YouTube (Wen Wild), Snapchat (wwildhockey), Instagram (Wenatchee_wild), and on the team’s official website (wenatcheewildhockey.com). Listen to every game on KCSY - Sunny FM 93.9. Video streaming is available with HockeyTV.com. Wenatchee, WA- The Town Toyota Center sales and marketing had a banner year with new sponsors, Rink naming partner, and sold out all available VIP seating and suite areas. The management staff worked tenaciously to retain and increase partnerships across the organization. Sales assistant Cooper Elliott resigned in February to pursue his Master’s of Education degree. The arena opened the sales/marketing position. Lachlan Ross was hired in February 2018 as the new sales/marketing executive assistant. He graduated from Washington State University in May 2017 with a Bachelor’s degree in Sports Management and a minor in Business Administration. During his time at Wenatchee Valley College and WSU, he worked with a variety of sports entities such as instructing private and group ice skating sessions, volunteer coach for a youth hockey team, assisted in coordinating the Palouse Summer Series baseball event, and a volunteer manager for the WSU women’s basketball team. Ross was the Treasurer and Vice-President of the Sports Management Club at Washington State. Prior to graduating, he completed a summer internship with the Wenatchee AppleSox and group sales training. Ross will assist in planning in-house events, sponsorship sales, and premium ticket sales for the hockey season. For questions please contact, Jennifer Bushong, VP Marketing/Sales/Communication at jbushong@towntoyotacenter.com or call 509.888.7333. Wenatchee, WA. –The Public Facilities District and the Town Toyota Center announced in a press conference this morning that an agreement has been reached with iFIBER Communications on a three-year Rink naming rights partnership until 2021. The total value and term are $90,000 of the life of the contract. In addition, iFIBER purchased a suite totaling $15,500 in the main arena for 2018. Under the new agreement, the complex will remain the Town Toyota Center. The Rink, will be re-branded as the iFIBER Rink. “We are excited to welcome our new partner to add to our already strong Town Toyota brand,” states Mark Miller, General Manager of the Town Toyota Center. “iFIBER Communications will be an exceptional partner for the Rink and our region,” adds Miller. As iFIBER Communications explored ways to build their brand awareness, the Rink naming partnership made sense,” states Kelly Ryan, Founder & Chief Executive Officer of iFIBER. The Rink draws nearly 100,000 users annually from youth hockey practice and tournaments, public ice skating to figure skaters. The Rink is “the heart and soul of the region,” adds Jennifer Bushong, Vice-President of Marketing for the Town Toyota Center. The Town Auto Group has been the building naming partner since its inception in 2008. The local dealership is a tremendous community asset and will remain the main naming partner of the complex. The term and value is $1.8 million for the 10-year period. “Town Toyota is pleased to be the Naming Partner of the arena complex as we strive to provide entertainment, cultural enrichment opportunities, and athletics events in our region. We care about our community and believe our local sponsorship has been well-received. The passion for the center is contagious and arena’s manager’s maximize our Town Toyota brand daily. We are thrilled that the arena continues to offer viable outlets for our youth to play sports and for our customers to be entertained. We continue to welcome new businesses in the region, like iFIBER Communications, for the facility to not only survive, but thrive for generations to come,” read by Ms. Bushong from a statement from Tony Lisson, General Manager of Town Toyota. Since the arena opened October 2008, the Town Toyota Center has drawn nearly 4 million guests to the Wenatchee area, generated nearly 70 million dollars in economic impact, hosted hundreds of Wenatchee Wild games, 100’s of concerts and shows, regional trade shows, basketball tournaments, and regional figure skating competitions. The Town Toyota Center is a multi-purpose arena containing 4,200 seats and the second permanent ice rink. All community leaders, sponsors, partners, and stakeholders are invited to attend. Please RSVP to Jennifer Bushong, marketing@towntoyotacenter.com by Thursday, January 18 at 5:00 p.m. The Town Toyota Center is a multi-purpose facility with 4,200 seats in the main arena and a second permanent Ice Rink. The Town Toyota Center hosts a variety of world-class entertainment and high-impact sporting events as well as being the home of the Wenatchee Wild hockey team. The Wenatchee Wild, proud members of the British Columbia Hockey League, in conjunction with the BCHL and the Powell River Kings have announced the makeup date for the postponed matchup from a week ago. The rescheduled game will be played Wednesday, January 31, 2018 at 6:30 pm at Town Toyota Center. The Kings bus broke down while en route to Wenatchee for the game originally scheduled to be played Friday November 3, and it’s since been determined the engine seized. All potential remedies to play the game as scheduled were examined but none were able to be implemented. The task of finding a suitable date for rescheduling the game required considerable effort on the parts of both teams, the league, and the facility before arriving at the agreed upon solution. Tickets for the originally scheduled November 3 date will be honored at the January 31 game. Any questions may be directed to the Wild office by calling 509-888-7825. The Wenatchee Wild are celebrating their tenth season in the Valley. Stay up to date with the team all year long on Facebook (facebook.com/wenatcheewildhockey), Twitter (@WenatcheeWild1), YouTube (Wen Wild), Snapchat (wwildhockey), Instagram (Wenatchee_wild), and on the team’s official website (wenatcheewildhockey.com). Listen to every game on KCSY - Sunny FM 93.9. Download our free “Wenatchee Wild” app for your iOS or Android device.